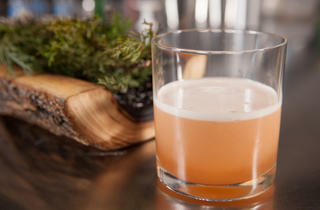 Photograph: Martha WilliamsLoaded to the Gunwalls cocktail at The Aviary. 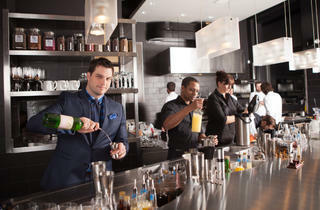 Photograph: Martha WilliamsO'Doyle Rules cocktail at The Aviary. 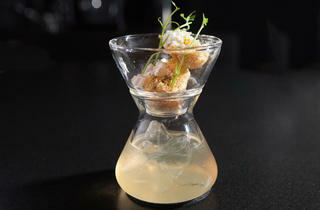 Photograph: Martha WilliamsJuniper cocktail at The Aviary. 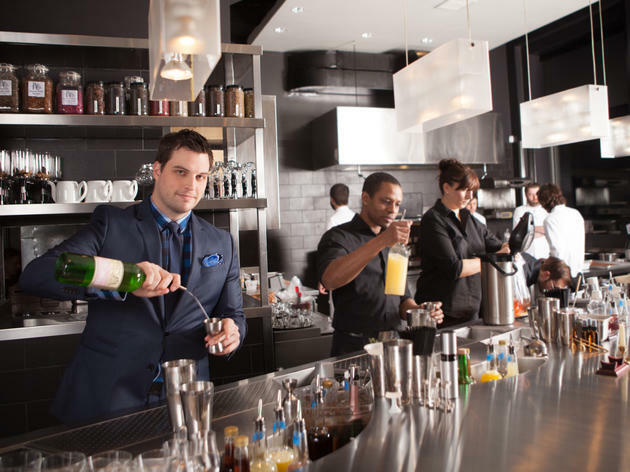 When Grant Achatz does a cocktail bar, it should go without saying that it's no ordinary cocktail bar. 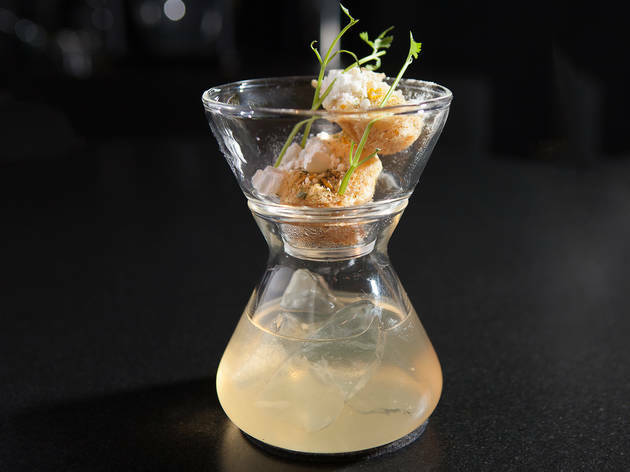 At the Aviary, which opened next door to Next in 2011, cocktails receive the same innovative treatment from beverage director Micah Melton as the food at Next or Alinea. That is to say, you should expect to drink cocktails like the Junglebird, a science experiment in liquid density, with layers of rum, campari, pineapple-lime syrup and rum "pearls" suspended in the drink. 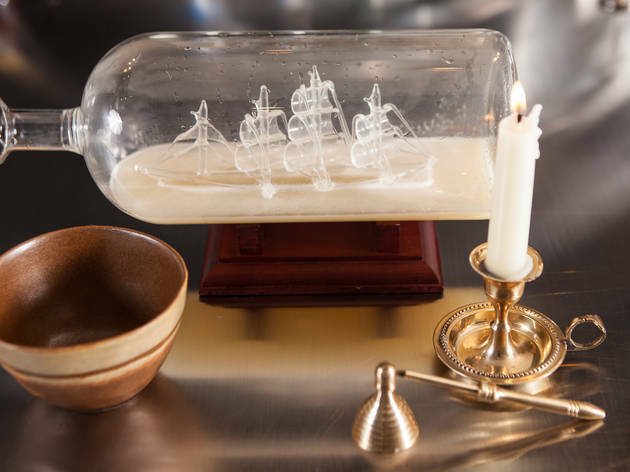 O'Doyle Rules comes with a fried banana snack on top of the rum-curry-cognac concoction, while Loaded to the Gunwalls is delivered with a single tapered candle. 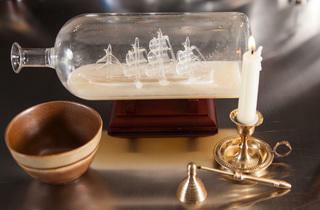 The drink, with pineapple, hazelnut and Batavia Arrack, is served in a glass ship in a bottle. 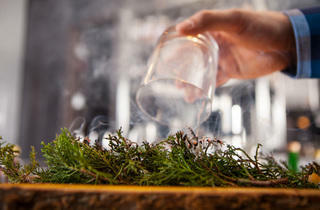 You've never seen a drink like it, and given how rare a visit to the Aviary is, you may never again. El stop: Green, Pink to Morgan. Bus: 8, 20, 56, 65. Eh? Lol. I am probably in the minority when it comes to not absolutely swooning over this highly acclaimed bar. I recently did the tasting 3-cocktail flight. The only cocktails that were among the super crazy, super expensive variety were the second cocktail in the flight; the first and last cocktail options were all pretty tame. My biggest grievance with The Aviary was the service; no one ever came and checked in on us to ask us if we needed anything and no one ever brought us water. After about an hour, we were finally able to flag someone down and request water. The cocktails tasted very, very nice...but so do the cocktails at Scofflaw, Barrelhouse Flat, The Violet Hour, GreenRiver, etc. etc. Not sure if this was worth the extra price tag and lack of attentive service. Maybe it was an off night? Sonnets could be written about Aviary, but I’ll keep it short for this review. Eclectic. Inventive. Masterful. You might be able to tell I’m a fan due to the profile picture (this drink is served in two pieces of rare glass!!! ), but I really cannot speak highly enough. 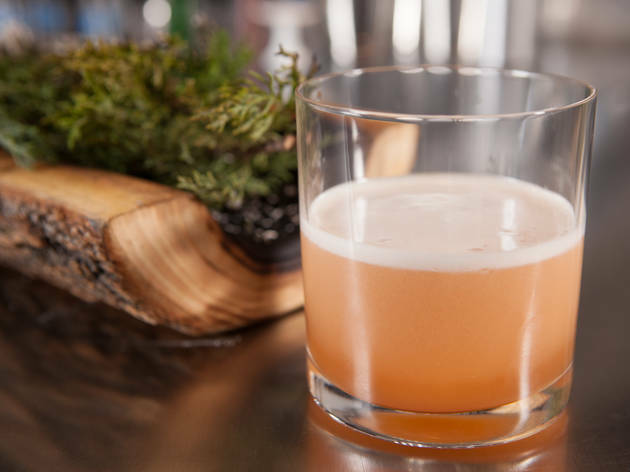 Aviary’s drinks are expertly crafted, and the flying bird graphics on the menu let you know just how gimmicky the presentation will be- handy for when you’ve got a tough crowd. The service is phenomenal, the food, although served in bite sized portions, is fantastic (try the pork rind- pssst, there’s a vegetarian version too!) and the ambiance is perfect. 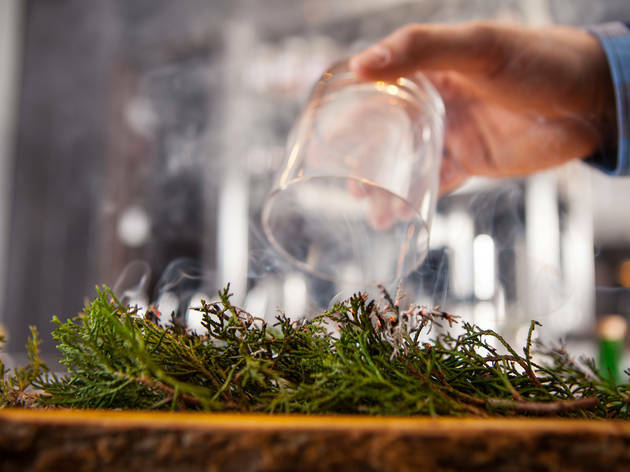 The Aviary is an exceptional place to celebrate a special occasion. The atmosphere here is definitely classy - a swanky cocktail lounge mixed with a magical chemistry lab. Service is impeccable, from the doorman (reservations highly suggested) to the knowledgable main server and everyone in between. Only downside is fellow patrons who feel entitled to bad behavior because they are splashing some cash. Drinks included an old-fashioned inside an ice ball broken with a slingshot, and delicious complimentary mescal anniversary cocktails! This is probably the most unique drinking experience you can have in Chicago. I've been multiple times and I'm always blown away by how innovative the cocktails are. If you don't have a reservation try going right when they open, it's usually fairly easily to get a table then. Worth the time for reserving ahead and dropping in for a drink experience. They'll treat you well. Drinks are amazing, too.